If you’re looking for a beautiful plant to fill in areas that get light to heavy shade this one is a ripper. 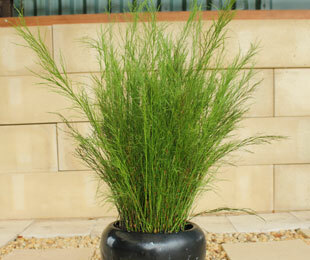 Feathertop™ Baloskion has soft feathery foliage that looks soft and desirable. Feathertop is far more compact than the common form being less than half the height growing to 60 to 70 cm. It’s interesting foliage makes it a real showpiece. It can handle full sun if it is grown in good soils and just given a little bit of extra water. It makes a great rain garden plant and it grows really well with wet feet. It’s foliage makes a great filler in a vase set amongst flowers. For something a little different that’s fairly forgiving to grow, give Feathertop™ Baloskion a try.